Just like his sister, dad, and granddaddy before him, Daniel Matthews married his high school sweetheart and joined the Navy. That he had the choice to marry a man after the repeal of Don’t Ask, Don’t Tell was a slight difference. Being apart from his husband more often than not might be a given, but winning the First Kiss raffle was a prank gone right. Since they met during freshman year, Ford Jennings knew his future husband’s dreams—to join the military and serve his country. Waiting pier side with a cameraman capturing his every move might be a requirement, but the chance to show others that love triumphs over any obstacle is an opportunity of a lifetime. For more information on the stories in the anthology, click HERE and then click on the Read An Excerpt link located below the cover. I want to thank Wicked Reads for having me today, and for letting me tell you more about the One Pulse Anthology which includes my short story, Raffled Kiss. Waking up to the tragedy of the Orlando shooting was something no one could have predicted. The news coverage was heartbreaking and impacted us all, not only as part of the LGBTQ+ community but as a nation. I’m grateful for the opportunity to write a story, not only to help raise funds for the victims, and family members of those affected, but for the chance to celebrate the triumph of love over every obstacle. Raffled Kiss is a new adult short story showcasing the impact that the repeal of Don’t Ask, Don’t Tell had on a long-standing military tradition. Military homecomings are always an exciting time for families reuniting with their service members, and the First Kiss raffle is a fun way to get funds for their holiday celebrations. Plus, they get to be the first one to off the ship, in this instance. As a Navy wife, we entered the raffle once or twice, but never had Daniel’s and Ford’s luck, nor their fairy godparents. I kept the events in the story as simple and real as possible. They’re newlyweds surviving their first deployment apart. They do have a solid support system, though. Daniel isn’t the traditional military hero in action books. He’s not an officer or special ops. He’s one of the many enlisted sailors serving their country out of tradition and love. Young enough to enjoy the path others forged for him to be able to serve without having to hide his husband. Since the repeal of DADT, there had been several First Kiss instances in which LGBTQ+ service members had taken part; most of them had made the national news. I’m not saying life in the military is now easy for them, but not having to hide is one less burden to carry around when protecting our freedom. It’s definitely getting better. Daniel has been at sea for the last eight months. It's his first deployment and the first time he's been away from his husband, Ford. Not everyone on the ship see his marriage as a good thing. The first kiss off the boat is being raffled off and Daniel's friends and family think it would be an amazing thing if that kiss was between Daniel and Ford. Raffled Kiss is a fun, feel good little read! Raffled Kiss was a lovely little story that left me smiling. Hunter gives us a look at Daniel’s life onboard the Naval ship he serves, as he’s counting down the days until he can see his husband again after being apart for eight months. We get a quick look at his interactions with shipmates who have no issue with his homosexuality and at least one who does. The author then gives us a look at Daniel’s husband, Ford, as he goes about his day, spending time with his mother-in-law and others like him at the Family Readiness Group (FRG) meetings as they prepare for their military family members’ return home. Ford adores his mother-in-law… until she rallies the group to purchase raffle tickets for the ship’s First Kiss. Now, being as this is a romance, it’s not a big stretch of the imagination to figure out who wins, but what’s cute is each man’s reaction because they’re each worried their husband is going to be upset over their friends and family’s meddling. As for the kiss, well you’re going to have to read that for yourself. In addition to Raffled Kiss, I also read and enjoyed the stories written by Bree Cariad and Edmond Manning. I hope to read more of the stories as they are short enough to squeeze in on a lunch break. 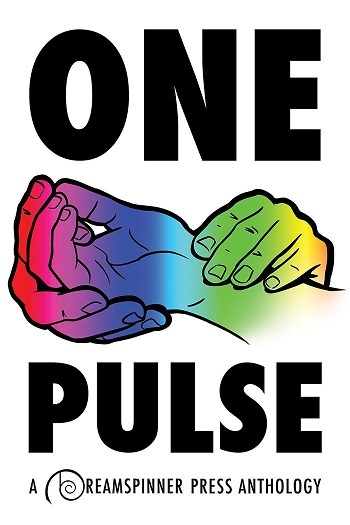 Reviewers on the Wicked Reads Review Team were provided a free copy of One Pulse Anthology to read and review for this tour.